You may not admit it, but fried chicken recipes are probably the most famous of all chicken recipes. Perhaps it was a certain Colonal from Kentucky who contributed to this global addiction but without a doubt there's little to beat a Southern Fried Chicken Recipe. "Crispy Fried Chicken Keeps Them Coming Back For More." 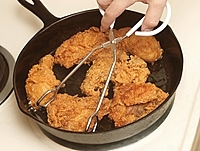 Frying is certainly a useful method for cooking chicken especially if you want to save time. Grilled chicken is healthier but I'll save that for another page. 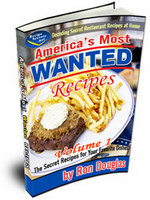 So if its low-fat chicken recipes you're after then this is not the right place. If you realy want to, you can remove the skin from the chicken piece before frying it and serve with salad but to me that's like having fat free milk in your coffee and then stirring in 3 sugars to wash down your cream scones. That said, let's not go over board on the oil and when you're finished frying your chicken pieces do drain them on absorbant kitchen paper. This will reduce the oiliness and the unnecesscary (mispelled on purpose) kilojoules. The nicest accompanyments (or what goes best) with fried chicken is mash potato or chips otherwise known as fries depending on where in the world you live. So before we get going with the recipes, here are a few tips for better fried chicken....I am on the look out for more. Refrigerate your coated chicken pieces for an hour before frying them, the coating will stick better. Instead of using egg to get the coating to stick to the chicken pieces, try mayonnaise. Mayonnaise clings to the chicken, doesn't drip and it has great flavour. Use half flour and half corn starch with a 1/2 teaspoon of baking powder in your coating mix for a very crispy result. When pan-frying, cover for the first 5 minutes of cooking and then uncover for the remainder of the cooking time. Covering the frying pan for the a short period of time will help cook the chicken thoroughly.